The Marie Curie medal holds the distinction of being the first one honouring a woman. Curie was also the first woman to receive the Nobel Prize in 1903, for physics. Born Maria Sklodowska in Warsaw, she married French physicist Pierre Curie and together they discovered natural radioactivity. Further research led her to determine the atomic weight of radium which earned her a second Nobel Prize in 1911, for chemistry. Great scholarship notwithstanding, she still had to fight the prejudices of her day. Her humanitarian ideals bore fruit with the founding of a research institute in Paris that today bears her name. Issued for the 130th anniversary of Curie’s birth, the medal was unveiled at an international event in 1998 to launch UNESCO’s Future Scientists campaign, aiming to inspire young people, especially girls, to pursue scientific studies and careers. 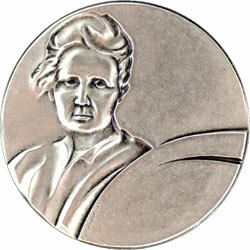 Created by the Polish artist Magdalena Dobrucka, the obverse shows Curie’s portrait. 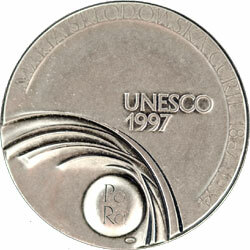 The reverse is inscribed Maria Sklodowska Curie 1867-1934, UNESCO 1997, with Po and Ra, the symbols of the chemical elements, polonium and radium. Polonium was co-discovered by Curie and named after her native country.